Hello everyone, lately i have really become a health conscious person the result of that is the introduction of ragi in to the daily diet. 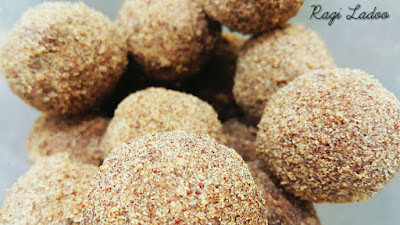 Today this recipe for ragi ladoo is also a result of that... and recently i have made the ragi khuz in a very traditional way, i will be updating the recipe for it soon. Ok coming back to today's recipe, normally white sugar is being used for making ladoo's but i am totally against the white sugar and try to my max to avoid the usage of white sugar in my recipes. 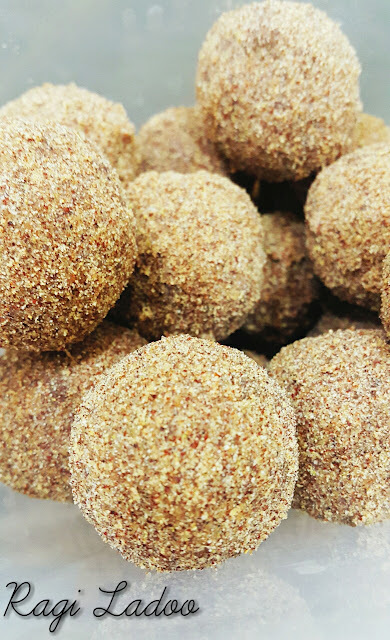 But i can never stay away from sweets as i have a very strong sweet tooth :D so i replace sugar with jaggery which is a healthier version of sugar, not only that consumption of jaggery means consumption of iron. This recipe is a double damaka as Ragi is high in absorbable calcium, iron and fiber.... when combined with jaggery this becomes very nutritious sweet to be consumed. Pour the ghee in a roasting pan and once heated add the ragi powder to it and keep roasting for 15 - 20 mins. TIP: if the mixture becomes cold and it becomes hard to make the balls, heat the mixture in microwave for a minute. WOW!The ladoo looks healthy, yummy and perfect.